One way or another, all the really big guys make movies about themselves making movies. Luis Buñuel may be caught most conspicuously doing so at the beginning of his career, in Un Chien andalou, and at what must be temporarily accounted the end of his career, Le Charme discret de la bourgeoisie, until Le Fantôme de la Liberté gets here or until Buñuel really does stop making films, as he’s been threatening to do for about a decade now. Unlike most of its sophomoric contemporaries, Un Chien andalou operates as a most lucid disquisition on a kind of formal logic peculiarly available to the cinema. The recurrent patterns of diagonal design (the pattern in Buñuel’s tie, the lines on the lid of the cyclist’s box and the wrapping paper inside) and diagonal movement (the stropping of the razor, the woman’s arrangement of untenanted garments on the bed) attest to the possibility of formal integrity without reference to any conventional, mundane logic. The succession of visually similar forms (a hole in the hand, a tuft of underarm hair, a sea urchin, a head glimpsed in a god’s-eye-view iris-shot) provides its own poetic justification, and a sinister shot-pairing (clouds cut across moon, razor cuts across eye) testifies to the power of editorial progression! A woman “hears” and reacts to the approach of a cyclist whose only sensory signal has been to enter and pass out of a right-angle frame of a street scene disposed between two shots of her looking at a book in a room somewhere: shot juxtaposition creates its own acceptable narrative logic. And that room she sits in, having been established in a conventional full shot at the beginning, can be broken up by camera angling and restructured by montage so that its window looks down on both a city street and a desolate beach, and its door opens on a stairway, the seashore, or the mirror duplication of the selfsame room, depending on where the narrative chooses to go next. Truly, Buñuel opens not only the girl’s but also his and our eyes to a new kind of vision. “Now,” says Buñuel, “society itself has become so violent that it is hard to use violence to make an artistic comment.” The jarring cuts and outrageous juxtapositions that, as much as the content of the images, lend such a ferocity to Un Chien andalou are also to be observed in Le Charme discret. But oh the difference! If, as Henry Miller once wrote, Buñuel at first seemed to be throwing bombs, now it is as though he were tossing bouquets. The director’s audience has changed—the razor still makes us wince and always will, but we aren’t likely to be so philistine as to stage a riot at the showing of a Buñuel picture—and the director, if he has not precisely changed or abandoned any of his social anger, has grown much, much older; he has grown older with his favorite target, the bourgeoisie, and if the contempt is still there, so now is a kind of existential fondness. Like veterans of a long-ago war, we can sit down together and reminisce, waiting to be done in individually by our weaknesses (for Buñuel, alcoholism, deafness, a little genial fetishism) and collectively by history. What’s a little murder among friends? L’Age d’ôr begins as a dry documentary on scorpions and Las Hurdes, or rather the voiceover commentary thereon, conducts us on a dispassionate tour of a landscape of death. Even Un Chien andalou affected its own bizarre brand of casualness: threaten me with a tennis racquet, will you?—all right then, I’ll pull pianos at you! (What could be more natural? the film seems to ask.) Buñuel’s films are art films, by anyone’s definition of that dubious term, but there is also something imperturbably artless about them. A Mexican film historian has recorded that Buñuel loved to let his gifted cameraman Figueroa set up some luscious composition, whereupon El Jefe would instruct him to turn the camera around and catch an unphotogenic shot of Nazario coming around that quite uninteresting bend of the road. His camera moves so purposelessly at times—not the purposelessness of the film-school jackoff who wants to write his flashy signature across every scene, but rather the transition-easing aimlessness of the directorial nonentity who feels uncomfortable about cutting between static takes and so figures, what the hell, a little panning, a little tracking, a tiltdown from the sky, just to set the viewer slightly off-balance so that he’l1 accept whatever stability I finally offer, and in the meantime I’ll have made my transition. Now, no, I’m not saying that that‘s Buñuel. But Buñuel, with the simplicity of genius, has taken that frowsy tactic and invested it with meaning, the kind of meaning that enhances our moment-to-moment experience of his films. We don’t—or shouldn’t—watch his films in fits and starts (“What’d the little kid say? She dreamed about a black bull? Hold it, we don’t go any further till I hear more about that black bull!”). We go with the deceptively casual flow that bespeaks a sensibility beyond being shocked by the matter-of-fact discovery of atrocity in the world. There are times in Discreet Charm when Buñuel seems to be exploring, or at least seeking to exhaust, the basic possibilities for scene arrangement. Consider those unaccountable passages of the charming bourgeois walking along a road somewhere while unseen traffic drones on the soundtrack. Buñuel initiates the first of them as he initiates the first post-titles shot in the film, by swinging his camera down from the sky to pick up our gang. He then proceeds to show a number of ways in which it is possible to photograph people on a road: you can travel alongside them, or you can withdraw ahead of them, or you can watch them walk away from you, or you can establish your frame around some available space and let them walk into it, or… One of the frustrated luncheons begins the same way: the camera is tilting down the colorful wall of a chic restaurant; the colors are striking, but a wall is only a wall, after all, and we want something more—people, for instance. So the camera follows a waiter, and then it notices a customer moving in another direction and follows him, and then its interest is caught by another waiter doing something else; and about that time Buñuel is ready to bring on the official characters—in this case, the three main women in the movie. What might be narrative padding in someone else’s film, or a statement of belief in cosmic design (e.g., the “Every step is counted” scene at the opera in Max Ophuls’ Letter from an Unknown Woman), operates here as a kind of instruction to the viewer: arbitrariness is not to be taken lightly. A moment later, out of the clientele of this restaurant and the background of a shot will step a nice-looking but quite abstracted young man who will relate a tale (“a bit long but very interesting”) about a youthful indulgence in filial homicide. The ladies listen tolerantly, more disconcerted by the restaurant’s inability to supply their preferred beverages than by his horrific narrative. He walks away; one of the ladies remembers a rendezvous elsewhere, and departs; the camera pans her to the door where the young man is noticed again. A reopening of his story? Something to connect him and it to our main personages? No. He opens the door for Simone, Simone smiles her appreciation, we cut to a new location, and the young man is never heard from again. Buñuel keeps setting up little realities and permitting us to watch them develop unexpected patterns, sequences, trajectories. The friends arrive at the Sénéchals’ for their second attempt at having a meal there. Monsieur and Madame are upstairs trying to extricate each other from their clothes. The maid, after giving the guests a drink as ordered, goes out a side door and, by means of her, the camera’s attention is directed back to the Sénéchals, who are climbing down the trellis to have a soundproof roll in the shrubs. Inside the house the guests, who been discussing the right and wrong ways to drink, learn that their hosts have “gone out.” Acosta and Thévenot leap to the conclusion that there’s going to be a raid (they’re dope smugglers, after all—and doesn’t that conclusion make more sense than the true explanation?) and they hustle themselves away. As their limousine surges down the driveway, Florence leaning out the window and repeating her celebrated martini-barfing act of the night before, the car wipes a churchman making his way toward the house. In common decency the scene should have ended with their flight, but no, by one of the most timeworn visual stratagems in cinema Buñuel keeps it going. The monsignor introduces himself to the maid, provides a few autobiographical details, and expresses some interest in the gardener’s shed. Tight shot of his eyes after the maid leaves; cut to the gardener’s shed, the door of which opens to admit the clergyman. A fantasy? No, for we cut back to the house, to which the Sénéchals return, pulling grass from their hair, and a moment later the monsignor appears at the door in the costume of a gardener. He is ejected as a presumptuous upstart, but when he returns a moment later in his proper regalia he is admitted and, gingerly, engaged as gardener at union wages (“I live by the rules”). François Sénéchal shows him to the door; both exit. As they leave, slightly out-of-focus in the distance, Mme. Sénéchal steps into the foreground of the shot, pauses, then continues across the interior of the house, the camera panning naturally to follow her. For the last several minutes we have geared ourselves to accept the fact that we were watching a scene about a bishop who wants to be a gardener. But now we notice, as does Mme. Sénéchal, that in the diningroom the servants are clearing the unused luncheon settings. That’s right—that was also in this same sequence, what the sequence ought, according to normal usage, to have been about…. And that scene, as already described, gives way to Simone Thévenot’s rendezvous with Raphael at the Mirandan embassy, which becomes one of many interrupted events in the film. The departure from the embassy of the Thévenots’ car again serves to introduce a new factor into the sequence: the girl from Miranda who, Raphael has insisted, is part of a band of terrorists bent on murdering him. And lo, maybe his comically paranoid suspicions were correct after all, for he drags her into his apartment and uncovers a gun among the foodstuffs in her shopping bag. A conversation follows: part political dialogue, part seduction, and all discontinuous except in terms of a surreal course of action and reaction as both parties sit playing with their self-images. After more turns-about than we can keep track of, Raphael magnanimously permits his would-be assassin to leave; but he straightway goes to the window, gestures significantly with a handkerchief, and observes as two waiting plainclothesmen seize the girl and bundle her off in a car. Again we flash back to the beginning of the sequence and consider, didn’t he expect to spend the afternoon tupping Simone? So why should he have two guards waiting to haul away a girl he doesn’t know is coming? Has everything from Raphael’s first glimpse out the window been a reverie to restore his sense of man(-of-the-world-)hood frustrated by the arrival of Simone’s husband? Don’t ask. Or do ask. Buñuel doesn’t mind. He expects it, even encourages it. The structure of his film implies correspondences between (among?) the various levels of reality within the film: waking reality (which may be restricted to the scene of Raphael frantically gorbing in his kitchen at film’s end), dreamlike narrated reality (the lieutenant’s tale), dream reality (the army sergeant’s dream, François’s dream about the Colonel’s dinner party), dream of dream reality (Henri’s dreaming François’s dream and then his own), dream of dreamlike narrated reality (the police commissioner dreaming about the policeman telling another policeman the story of the Bloody Sergeant), and perhaps dream of dream of dream reality (Raphael:Henri:François) or dream of dream of dreamlike narrated reality (Raphael:police commissioner …). Consider some level-to-level correspondences: In consecutive scenes the monsignor and the lieutenant recount the bloody deaths of their parents. The lieutenant’s dreamlike but supposedly authentic account of meeting his mother’s ghost and murdering his false father atmospherically resembles the young army sergeant’s avowed dream of encountering the dead in an otherwise empty, unreal street filled with the sounds of absentee celebrants. The sergeant meets a young girl who appears to be his lover, or perhaps a sister, but is ultimately addressed as Mother, while back in what we temporarily take for real life the young maid Ines admits to being 52. The two-dimensional painted backdrop of the sergeant’s dream anticipates the frustration of the next interrupted-dinner scene when the Colonel’s banquet table proves to be located on a theater stage. And about the time we assume nothing is ever going to reach logical completion in this film, the monsignor meets up with the murderer of his parents and turns him into a visual replica of one of the figures in the lieutenant’s tale. How much are waking paranoias (the Miranda terrorist girl, the fear of a raid) borne out in action (raids on two subsequent Sénéchal meals do occur) and how much are they merely extended by runaway dream logic (the final murderous raid is certainly a dream of Raphael, and the first, more formal raid may well be)? Is Ines’ announced age of 52 an indication that reality is as irrational as the dream-worlds of the film or is it a clue, like the second Napoleon’s-hat incident at the second Colonel’s dinner party, that we are still in a dream (because, as we soon learn, we are)? We, as watchers in a darkened room, are locked into any dream Luis Buñuel wishes to dream for us onscreen. The joy—and profundity—of Discreet Charm of the Bourgeoisie inheres in the inseparability of the characters’ dream logic and the director’s narrative logic. When the Colonel gives his address (“We live at”—CUT—”17 rue de Parc”) and we whip-pan from the numeral to the guests getting out of their car, Buñuel has asserted his complete power over time (several days’ worth) and space (an indeterminate amount). The guests might see, as we might see, that the building they enter is a propped-up stage flat; but they go in, and we accept the reality of the scene Buñuel has them play, and never question being in a room with only three walls because directors often don’t show the fourth wall; and then Buñuel in effect says, Well, you will go on believing in fourth walls that aren’t there, but as a matter of fact this fourth wall that I now show to you is a curtain, and it’s opening, and you’re on a stage and you don’t know the lines! We don’t enjoy the luxury of sitting out in the jeering audience, for we’ve been duped as well. The camera unobtrusively closes in on François Sénéchal, whose dream this is going to turn out to be—for a while; and we recall an early, presumably real scene in the film: the guests arriving at the Sénéchals’ for their first go at having a dinner, the majority of the company making chat while the laid-back Florence prowls about the room and brings a peculiar intensity to the scene as she comes into the foreground and almost seems to scrutinize the camera itself. It’s as if Buñuel had announced back then how easily the individual can enter a scene like one of these socially elegant and societally irresponsible bourgeois, enter it and consume it, turn the objective reality of the world into a subjective space for one’s own direct or subliminal gratification. The lesson Buñuel himself seems to have learned is that, for all his rage, for all his horror of acquisitiveness in a starving world, his roving, sometimes documentary-like camera has captured him a universe and brought him an intense sense of gratification all his own. And so he sits among the clientele in Belle de jour‘s outdoor café listening to coach bells that he can probably hear only through earphones these days, and he savors the delights of his motion picture medium as though they were the bright and flavorful treasures in Raphael’s icebox. It’s gratification that he’s earned, and he shares it with us all. France, 1972. Direction: Luis Buñuel. 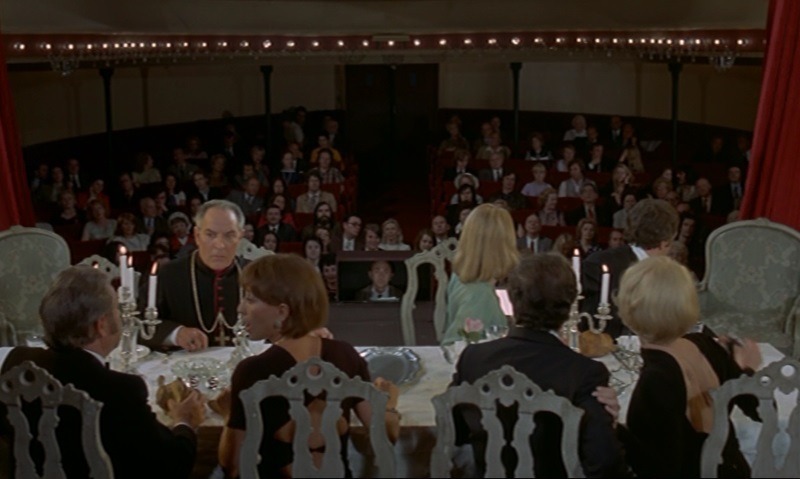 Screenplay: Buñuel and Jean-Claude Carrière. Cinematography (Eastmancolor): Edmond Richard. Art direction: Pierre Guffroy. Editing: Hélène Plemiannikov. Sound effects: Buñuel. 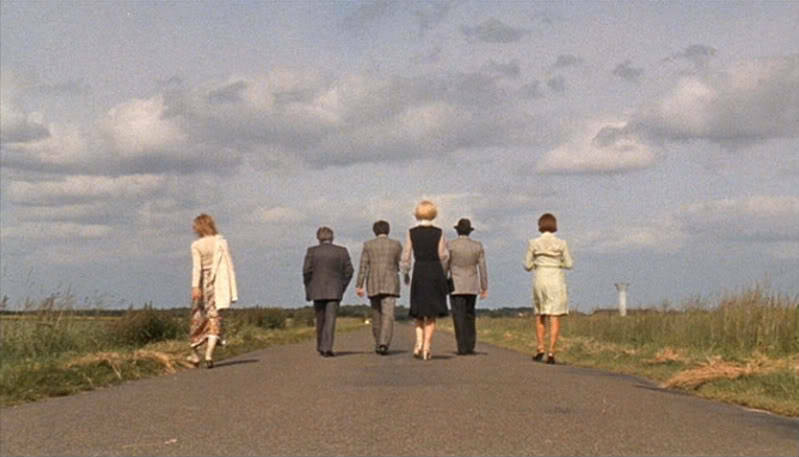 The Players: Fernando Rey, Delphine Seyrig, Paul Frankeur, Bulle Ogier, Jean-Pierre Cassel, Stéphane Audran, Julien Bertheau, Muni, Claude Piéplu, Francis Maistre, Michel Piccoli.